Rev. Brunilda (Bruny) Martinez (Part-Time Local Pastor) from Allentown: La Trinidad UMC (Northeast District), 1/2 time, and Wind Gap: First UMC (Northeast District), 1/4 time; to Lebanon: St. Lukes UMC (Northwest District-West District), 1/2 time. Rev. Jose Tirado (Local Pastor) to Avondale UMC (1/4 time) and New London UMC (1/4 time). The Council of Bishops of The United Methodist Church is grieving with the Coptic Orthodox Church over the recent terrorist bombings that targeted Coptic churches in Egypt, killing at least 47 people as members celebrated Palm Sunday. The Coptic Church is the largest Christian Church in Northeast Africa and the Middle East. The United Methodist Church bishops expressed, in a letter sent to His Holiness Pope Tawadros II, Pope of Alexandria and Patriarch of the Holy See of St. Mark, sincere sympathy with the Christian brothers and sisters. "Please know The United Methodist Church grieves with you. As a part of the Universal Body of Christ, we acknowledge your pain is our pain, and we stand with you in this dark time," said the letter signed by Bishop Bruce Ough, President of the Council of Bishops and Bishop B. Michael Watson, UMC Ecumenical Officer. Read the full letter from the Council of Bishops here. Holy Week, lasting from this Sunday, April 9, to Saturday, April 15, is the "heart of the church's ritual, theological and missional life. Everything we do in worship, doctrine and mission springs from this week" according to Discipleship Ministries, which offers worship resources, including its "Through Death to Life" series. Details. 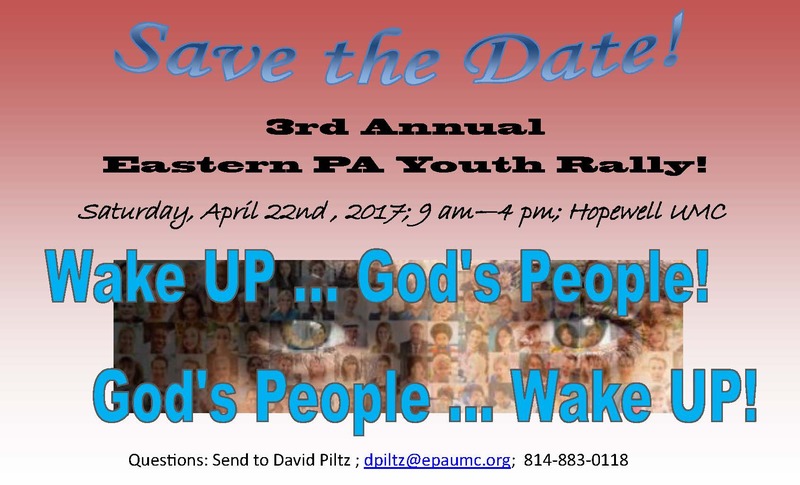 Many of our Eastern PA Conference churches will celebrate this special week in creative, inspirational ways, through prayer and worship, Christian education and spiritual nurture, community feasts and fellowship, and even some fun, including the usual Easter egg surprises. Visit our special Local Church Lenten Events page to learn more. Also visit our Flickr photo page to enjoy an album of photos from Berwyn UMC's 2016 Prayer Stations of the Cross. Last year on Good Friday, the church decorated its entire sanctuary with artistic, inspirational prayer stations arranged to symbolize Jesus's cross-bearing journey to Calvary. This year Berwyn invites all to come journey in guided prayer and meditation along the Way of the Cross any day of Holy Week and ending on Good Friday, April 14. Come at any time during the day, alone or with a friend, to explore prayer stations representing the final week of Jesus' life, where "He gave himself over to death; so we know that God is with us even unto death. We are not alone." Berwyn UMC is at 140 Waterloo Avenue, Berwyn. Contact the church for visiting times at (610) 644-5555 or office@berwynumc.org. The Eastern PA Conference Latino Commission will hold its annual Holy Convocation (Santo Convocacion) on Saturday, April 15, from 7 AM to 3 PM, at Buen Samaritano UMC (at West Chester UMC) in West Chester, Pa. With the theme "Cristo el Immigrante" ("Christ the Immigrant"), their program will feature immigration issues workshops for adults and youth, and a testimonial message by special guest the Rev. Emma Lozano (above), immigration activist and co-pastor of Lincoln UMC in Chicago. popular Sanctuary church that offers undocumented persons refuge from immigration enforcement, along with spiritual nurture and other assistance. She has fought for immigrant rights for over 30 years. View a CNN report about Lincoln UMC's ministry efforts and recent retaliation attacks. " Chicago 'sanctuary church' shelters immigrants, endures hate speech ." The full-day Holy Convocation, which annually occurs around Easter, will also feature a dialogue between adults and youth, three praise and worship services, a prayer-witness march around the community, breakfast and lunch, and Holy Communion with Bishop Peggy Johnson to end the day. All are invited, and some English language interpretation will be available. For more information, contact the Rev. Esdras Seda , Conference Latino Ministries Coordinator. United Methodist churches together will celebrate Native American Ministries Sunday, April 30 and will contribute to the special offering that offers hope and healing to improve the lives of Native American brothers and sisters in churches and communities nationwide. The downloadable Native American Ministries Sunday Pastor and Leader's Kit (with social media images, videos, an e-book and other tools) has everything churches need to get members excited about celebrating this UM Special Sunday. The offering supports Native American outreach ministries and provides scholarships for UM Native American seminarians. In this way, we can support Native American congregations efforts to minister to their communities with the love of Christ. Access your Pastor and Leader's Kit now! For more information, visit www.umcgiving.org/NAMS. Ministries ( CONAM) will host its quarterly fellowship gathering, this time at the Conference Office (980 Madison Ave., Norristown, PA.) rather than the usual Camp Innabah location. They invite everyone to come enjoy a special, creative worship service, a delicious fellowship meal and insightful discussion about encroaching oil pipeline threats to our environment and to Native American sacred sites. In particular, guests Malinda Clatterbuck and Tim Spiese will discuss the Atlantic Sunrise Pipeline near Lancaster, PA. The 2-hour event will begin at 4 PM on Native American Ministries Sunday. April 22: Healthy Transitions for Clergy Spouses , from 10 AM to 2 PM, at The Village Library Meeting Room in Morgantown, PA. Lunch is included. A workshop for spouses of clergy undergoing a 2017 transition in appointment, assignment or pastoral supervision. April 23-25: Fellowship of Associate Ministers and Local Pastors (FAMLP) Retreat at the Black Rock Retreat Center, 1345 Kirwood Pike, Quarryville, PA. For Associate Members, Local Pastors, Student Pastors as well as Certified Lay Ministers. Topic: "The Authority of Scripture," taught by the Rev. Rodney Shearer, Ph.D. Registration is closed. April 29: Tools for Ministry in all six districts. start in Coate sville May 1, using historic Olivet UMC as a launch site. "After a year of prayer, dia logue, research and more prayer, we rejoice that a new church start will begin on the Southeast District," announced the Rev. Dawn Taylor-Storm, District Superintendent. "We give thanks to Olivet UMC for having the vision of kingdom building and for granting use of their space for an office and eventually a worshiping community." The Rev. Elena Ortiz, pastor of New Birth (Nuevo Nacimiento) UMC in Lebanon, and the conference's Congregational Development Team are resourcing the new church start, as it focuses on reaching the growing Latino population in Coatesville and surrounding communities. The fledgling faith community will begin with small-group Bible study and community celebrations, led by four church planters. "We have found that church planting is very isolating work, and this new model is designed to care well for our planters as they engage in ministry," said Taylor-Storm. "We also give thanks for the churches on the Southeast District who provided funding to enable this new ministry. Indeed, we are the church together." If your church wants to participate offer its support for this new ministry, contact Taylor-Storm. All are invited to attend a Celebration and Prayer Service for the Church Planters-the Rev. Elena Ortiz, Ivelisse Berrios, Luz Aponte and Madeline Amil-on Monday, May 1, from 2 to 3 PM, at Olivet UMC, 310 E. Chestnut Street, Coatesville, PA. "We will pray for this new ministry," said their enthused superintendent, "and give thanks to God for our Church Planters who are living out the Great Commission." Please register online for the new church launch celebration (at no cost). 2017 Class of Certified Lay Ministers on Sunday, May 7, at 3 P.M. The ceremony, always an inspirational occasion, will occur at Montgomery Square UMC, 1900 County Line Road, North Wales, PA. Bishop Peggy Johnson will preach and assist Program Director Judy Ehninger in awarding well-earned certificates to the newly minted Certified Lay Ministers. The Rev. Michael Johnson, a Certified Spiritual Director, will share his approach to using dynamic prayers to bring the experience of Holy Communion to life at a Communion Workshop on Thursday, May 11. Registration is at 9 AM. The program begins at 9:30 AM. First UMC of Phoenixville (856 S. Main Street, Phoenixville) will host this workshop, sponsored by the Order of St. Luke. RSVP to the Rev. Bron Yocum at bronyocum@gmail.com. Johnson has a passion for making Communion more contextually relevant by preparing original prayers including the Great Thanksgiving. His prayers range from traditional to musical responses, including a rap-music version, to a wordless prayer offered entirely in video and photos. The event ends at noon with Communion. Clergy spouses are invited to attend the next Claiming Sabbath retreat for learning, fellowship and candid but confidential sharing on Saturday, May 13, from 9 AM to 4 PM, (lunch included) at Daylesford Abbey, 220 S. Valley Rd., Paoli, PA. These innovative, lively retreats are offered by and for clergy spouses to help them learn to celebrate true Sabbaths and resolve problems in their challenging roles, while reducing the isolation often caused by their circumstances. Julie Anderman, a skilled trainer and longtime clergy spouse, leads a leads a team of creative, experienced facilitators. The fee is $50, but a limited number of $25 scholarships are available from a Pastoral Excellence Network grant. All payments-by credit card or check (make out and mail to: Artos Retreats 607 Rose Petal Lane, Mount Joy, PA 17552)-must be received by May 7. Learn more and register on the event webpage , or write to Julie Anderman at artosretreats@gmail.com. These retreats are provided to clergy spouses by the conference Cabinet and Board of Health & Pension Benefits. April 29: Work Day, 9 AM -1 PM Come, help get our camp ready for the season. Lunch provided. Please call to RSVP. May 6: Open House and Flower Sale Pickup. Come get a tour and a chance to win camp gear. May 13: Disciple Training , 9 AM - 1 PM. May 13: Little Critters Preschool Camp Visit, 9:30 - 11 AM. Free. Call to register. May 6: Spring Work Day, 9 AM - 4 PM. Come join us for a day of helping to get camp ready for the summer. This is a great opportunity for youth groups, church groups, Boy Scouts, Girl Scouts, families, or individuals to work together on service projects, landscaping, painting, cleaning, and other projects around camp. Lunch will be provided. May 20: Spring Open House 10 AM - 3 PM. Live music, games, silent auction, hayrides, canoeing, s'mores, site tours, meet the staff, and much more!! April 22: Spring Work Day, 8 AM - 5PM. A great opportunity for families, youth groups, or individuals to work together on service projects. Opportunities include cleanup, construction, landscaping, and other projects around camp. Lunch and dinner are provided for our volunteers. April 23: Free Youth Group Night. Gretna will hold its final Sunday evening free youth event of the season from 4 to 6:30 PM. Youth in grades 6-12 can come with their church youth group and enjoy a sample of the summer camp experience, including games, speakers, worship, and camp fun! May 9: Spring Fling Senior Adult Day, 9:30 AM - 3 PM. May 13: Gretna Gritty 5K Mud Run, 7 AM. Join us for our annual Mud Run fundraiser! Climb, crawl, run and jump through our 3-mile course as we raise money to support the ministry of Gretna Glen. Competitive, recreational and kids run make for all levels of action where everyone can be involved. You can visit our information page or register today! May 20: Open House, 10 AM - 4 PM. Bring your friends and family have fun, check out the site and learn about the great programs that Gretna Glen has to offer. Tours will be available upon request. Philadelphia's 11th annual Faith and Spiritual Affairs Conference, on Friday, April 28, from 8 AM to 4 PM, will focus on empowering families and communities to respond to the opioid epidemic. The event will happen at the Pennsylvania Convention Center, 1101 Arch St. Philadelphia, PA. Registration is open. An estimated 23.5 million Americans are addicted to alcohol or drugs, and about 20 percent smoke cigarettes. Addiction results in numerous health problems, disrupts families and relationships, and can lead to behavioral health challenges such as isolation, depression and suicide. Nevertheless, countless individuals confront and overcome their addictions every year, often with the help of their faith, family, community, healthcare professionals and treatment programs. The Conference Commission on Religious & Race will offer a second opportunity for leaders who have taken the required Changing Racism course to share and extend their learning, as they continue the conversation on race and racism. The optional, informal gathering will happen on Saturday, Jun e 24, from 9 AM to 3 PM, at Grove UMC, 490 West Boot Road, West Chester PA.
Come, d elve more deeply into the history, dynamics and ramifications of racism in the USA. Learn and practice behaviors and strategies for dismantling the damaging effects of racism and seeking equity. Registration is online by June 12, with a fee of $15. Lunch is provided. NOTE: This workshop is open to all who have completed the Changing Racism Workshops or the Healing the Wounds of Racism Workshops at any time. For more information contact the Rev. Susan Worrell at rev.s.worrell@gmail.com or the Rev. Alicia Julia-Stanley at rev87mom@gmail.com . A Basic Course taught in Spanish by the Rev. Brunhilda Martinez is being rescheduled for for the fall at Emmanuel UMC in Allentown. This course needs at least 12 participants and is limited to the first 20 registrations. Cost: $35. Click here for the registration application.